After 23 years in the toy business, Kevin Curran knows Europeans prefer dollhouses small like their real houses. And people in India could use more affordable $5 toys that won't take up much of small monthly salaries. The Town of Tonawanda native also can tell that the Fisher-Price chicken-dancing Elmo doll that got packed in his moving boxes won't captivate the Japanese. Americans are the ones who grew up knowing the arm flapping jig. He has worked on a thousand toys and made so many international stops to far-flung offices -- learning, for example, that toy firemen for the French need hats that are long in back like their real ones -- that he circled the world three times one summer. A few weeks ago he came home to become general manager of Fisher-Price in East Aurora, the first local person to take charge of the historic company's headquarters. Even company founders -- Herm Fisher, of Pennsylvania, and Irving Price, of Massachusetts -- were out-of-towners. 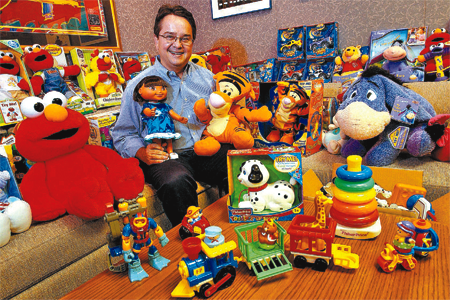 Curran left his New York City post in charge of Fisher-Price's cartoon character toys to take over the office of Neil Friedman, now president of the Mattel parent. Curran feels reverent about overseeing the 910 people who design 220 new toys every year for this office of the 75-year-old toy brand, credited with 6 percent growth and $727 million in sales last quarter. "Wow. This is a responsibility here," Curran said of how he reacted to the news. "You better do it right." He said it's still too soon for him to have plans for change. But from his new office, with the stuffed toys of his predecessor still perched on the couch, he talked about his uphill path in the toy business, his love of toys that do the unexpected, his humor and his serious international-bent. "We do want to make sure our people are getting outside East Aurora," he said of the importance of the world traveling that Fisher-Price people already do a lot of. He wants the company's global toy market share to go beyond the 5 percent it's been hovering at. "You have to get on the road if you want to grow." Curran's career started in the soap marketing division of Proctor & Gamble after he got his degree in economics and psychology from Williams College. At age 25 a recruiter's call led him to a Fisher-Price job. Early on he marketed the bubble blowing lawn mower and helped mastermind the toy windows that open and the milk shake that jiggles in the little plastic drive-through McDonald's. He remembers loving the job right off, especially the toy discount that made him a popular uncle at Christmas. Friends kidded him that he must have been clairvoyant when he picked this line from a Cat Stevens song to go with his 1975 Canisius High School senior yearbook picture: "Where do the children play?" After eight years, he went to Little Tikes in Ohio, a company known for its turtle-shaped sandboxes, and eventually led the European division from Brussels. He had such skill at working with people and recognizing their accomplishments that one of his first bosses, retired former executive David Fisher, was sorry when he heard Curran had left. When Fisher, who is no relation to the founder, heard of the latest promotion, he was pleased. "I was just very happy to know that Fisher-Price was going to be in good hands," he said. Curran returned to Fisher-Price in 1998 to lead product design as a senior vice president and help create the Sparkling Symphony "gym" that played Mozart and flashed lights with a baby's kick. For the past five years, he's been in New York City, commuting three hours a day from New Jersey to work as general manager of the company's Friends office for toys that match TV characters. "We needed a dose of Fisher-Price," he said of his work there. The "dose" was his urging to get New York staff, who'd come from many different companies, to think the Fisher-Price way of making toys do the unusual. After he won the license for Dora the Explorer cartoon character in 2002, a big doll was the first obvious and successful result. The Dora, who danced and sang her "we did it" song, was one of that holiday season's best-sellers. Next Curran asked for toys that children would play with differently: In 2004, Dora's Talking Dollhouse became the best selling dollhouse in Fisher-Price history. And for this coming holiday season, Fisher-Price has made Dora's Talking Kitchen that reads out ingredients in Spanish and English. "Those kinds of categories -- we had never done in the New York business," he said. Until he arrived, New York didn't have executives dressing up as Beatles album characters either. For last year's Christmas party, he rented the psychedelic costumes of the Sgt. Pepper album cover and got his vice presidents to join him singing a rhymed version of "A Little Help from My Friends." Silliness matters, he said. It inspires confidence. "People want to work for leaders who they think are real people that have hearts and minds just like they do," he said. "If you have the ability to laugh at yourself, it gives everybody else license to just be themselves." To Curran levity is also a symptom of humility. Something he shows by admitting mistakes. "I think it allows everybody who works for the leader to do the same," he said. "It's OK to change your mind if you hear a good argument." He wants these ideas to flow through the company known for wild creativity that had one department design invitations to a chocolate-themed office party by applying them as wrappers on candy bars. His first day in his new office was Halloween, a day when East Aurora staffers have their own costume-contest tradition. That morning a pirate, so well disguised he seemed unrecognizable, used a pirate voice to chastise people for being late. Curran and the other executives handed out candy as the Partridge Family cast from the 1970s TV show. Curran wore the loud plaid pants of the family band's escapade-prone manager -- a get-up he didn't choose, but went along with for fun. "The people I feel closest to are really right here in this company," he said of the ease he feels. "These are really my best friends." He gets pleasure just walking around the company headquarters that have the looks of a friendly college campus for toy studies. In the hallway outside Curran's office, a small plastic living room set with a small plastic person in a small plastic chair stands on a pedestal among others, like a row of sculptures in an art museum. Being in the toy business does keep a person young, said Curran, who wore a denim shirt embroidered with Fisher-Price characters. He didn't look 48. He has cherubic features and curly brown hair without obvious gray. When Curran does unpack his office boxes he intends to hang his framed version of Fisher's credo that he says still resonates. A successful toy, Fisher wrote, "must be in demand for birthdays, parties and week-end trips, and meet the daily need for good cheer and recreation, amusement and education." Now that Curran's close to living here full-time again, he and his wife Karen have been looking forward to amusing themselves at the Point Abino, Ont., beach house they built thinking it was for their retirement. Until next spring when his older son finishes his senior year of high school, Curran will stay at a company house and fly to New Jersey on the weekends. With his daughter already away at college, he will set up house in Western New York with his wife and younger son, now a high school freshman. Although his accountant father died years ago, his mother lives in Orchard Park and his three brothers -- some of his closest friends -- are local too. They're going to have to start sharing the Bills season's tickets he kept buying, waiting for the day he moved back. A week or so ago, he was at a hotel room in California at the end of a day's meetings with Toys R Us executives. He thought about the old quote he chose for his yearbook. He knows he didn't have a toy career in mind. He'd just liked Cat Stevens' message about people being more important than things and keeping life simple -- something he'll get a measure of in his new job. "I trade in a three-hour commute for evenings up on the lake in Point Abino," he said sounding happy.